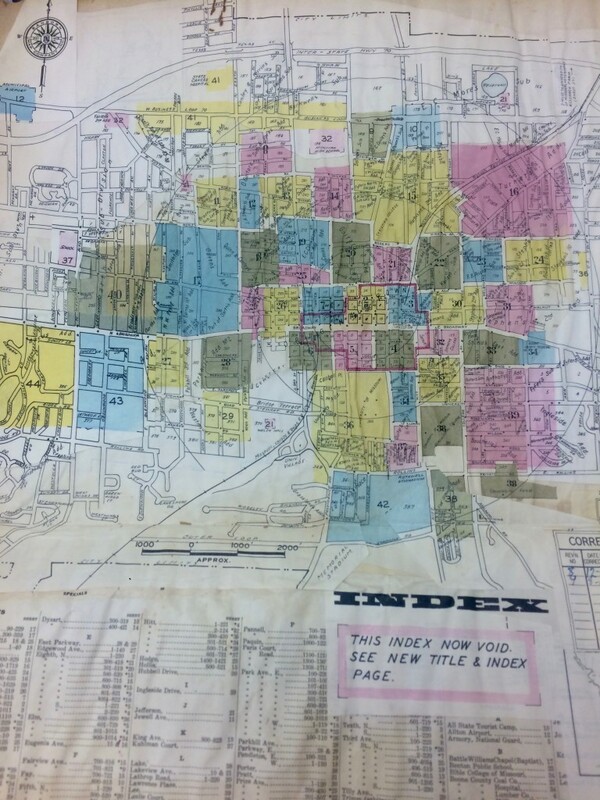 A friend stopped by my office the other day with something I’d only seen in digital form—a Sandborn Fire Insurance Map. Daniel Sanborn, a civil engineer and surveyor, created his first map in the mid-1800’s for an insurance company. 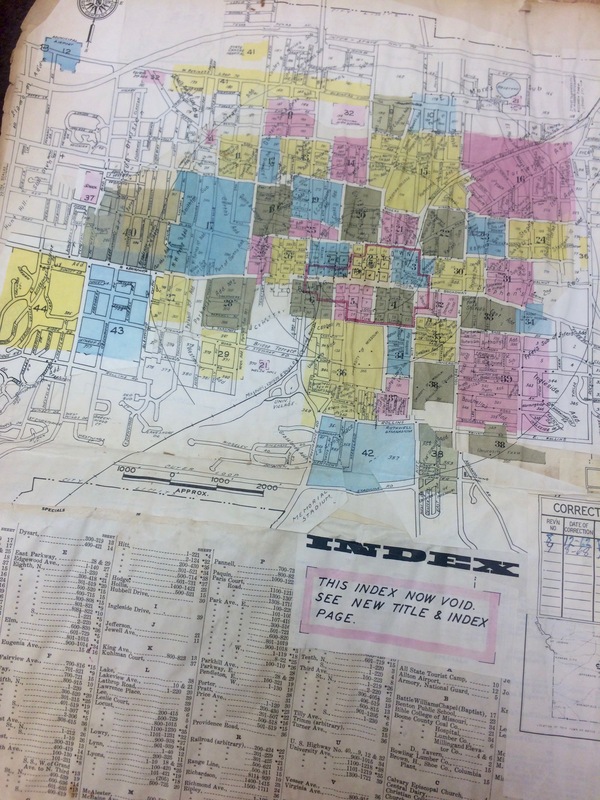 His maps quickly became the standard for calculating insurance risk and his company was soon mapping cities across the country. 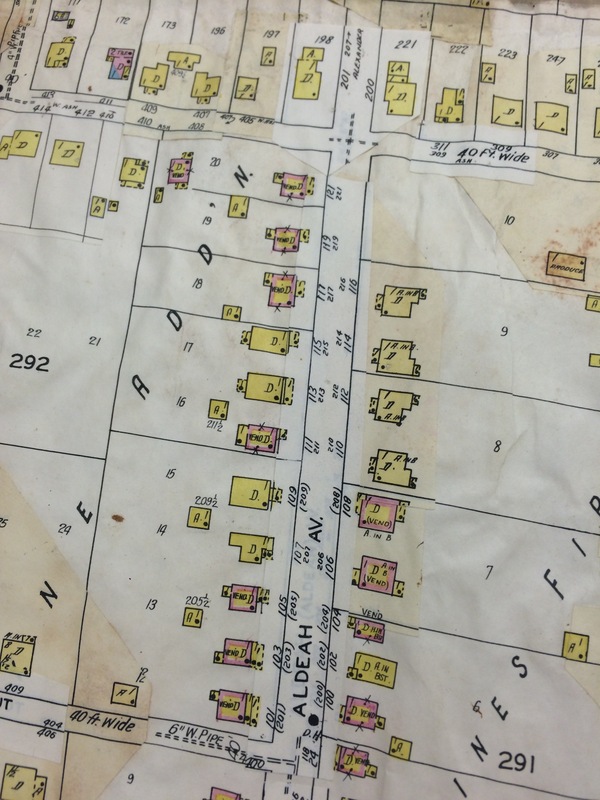 Sandborn maps are scaled version of a city that record key information including building locations, uses, construction materials, stories, fire hydrants, and more. They are invaluable for anyone interested in historic preservation and you can find digitized copies of many cities online or in libraries. That’s why it was so exciting to see him walk in with a large book of 44 separate maps of Columbia. Each map is 21 by 25 inches and is to scale. The first maps were dated from 1931 but contained updates through 1968. Any changes—-a building demolished, a new building constructed, a road improved, or a expansion of the city—were recorded on small pieces of paper (called “slips”) that were pasted over the old map. The result is a crinkly collage of buildings and roads. 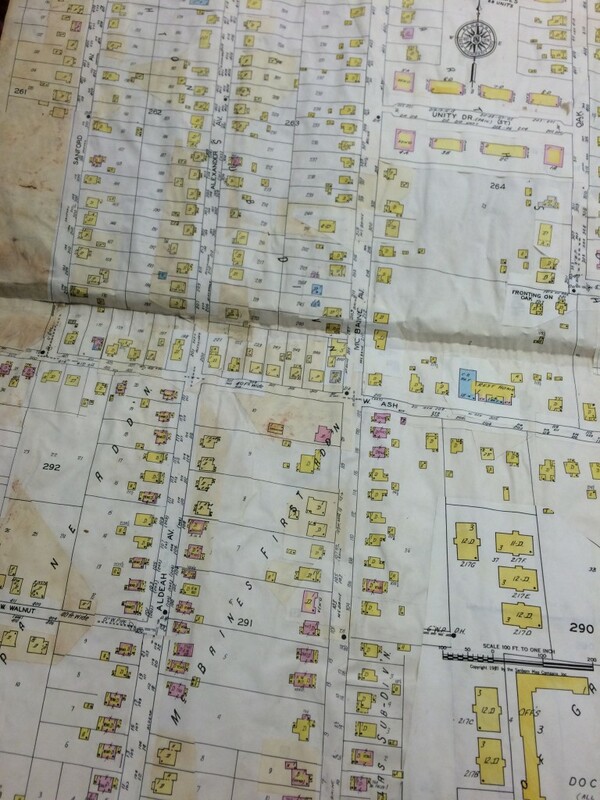 While it’s probably possible to remove these slips to see what the city used to look like, we found that shining a light underneath the page helped us read through the layers. Our neighborhood was easy to find with it’s long, narrow lots. Not much has changed on our street, although it’s clear that the houses just across the street from us were constructed after 1931 because a slip containing the new houses had been pasted over the vacant lots. A closer look revealed that the address change from 215 to 115 Aldeah. The yellow indicates a wood framed dwelling and the pink on some of the surrounding houses signifies a wood frame with brick veneer. Each dot shows an opening (including the opening onto the front porch) and the vertical slashes indicate the number of stories—in our case, one. Our garage had not yet been built but our neighbor’s garage is labeled “A” for auto house. 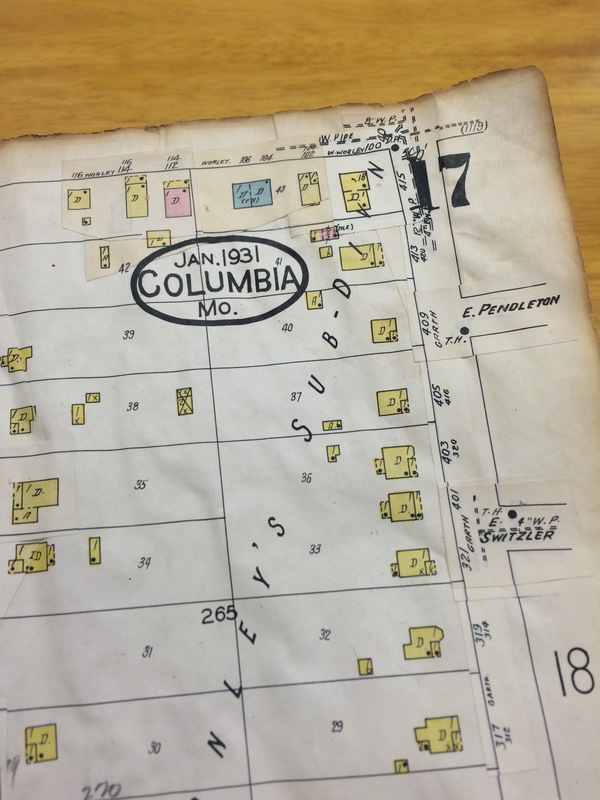 We’ve having tons of fun with the maps—Jonathan called in some of his neighbors to check out the downtown building that holds all their offices—so I’m in the process of finding out ways to preserve the maps. We’re having trouble finding a scanner big enough but we think we can take high resolution digital photographs of each map. That way, we’ll be able to really study the city without damaging the maps themselves.